Representative Bruce Vento was well-known as a champion for environmental causes in Minnesota and across the nation. During his tenure in Congress, he was chairman of the Subcommittee on National Parks, Forests, and Public Lands for ten years, overseeing the enactment of 300 laws. After his death in 2000, several places in the Metro area were established in his honor: the Vento View Overlook near Cherokee Park, the Bruce Vento Regional Trail in Maplewood and St. Paul, which then leads down through Swede Hollow to the Bruce Vento Nature Sanctuary. The 27-acre sanctuary is located just east of downtown St. Paul, tucked in between the railroad tracks along Warner Road and the bluffs below Mounds Park. One cave, called Wakan Tipi (Spirit House), was a significant site for the Native Americans living in the area. In 1853, the North Star Brewery was built here, and they used one of the caves to store beer. Starting in the 1880’s, the area became a railroad and industrial area, later becoming largely abandoned in the 1970’s. In 2001, a coalition of St. Paul residents, neighborhood groups, and the City of St. Paul started work on purchasing the land, and in 2005 it became an official park open to the public. 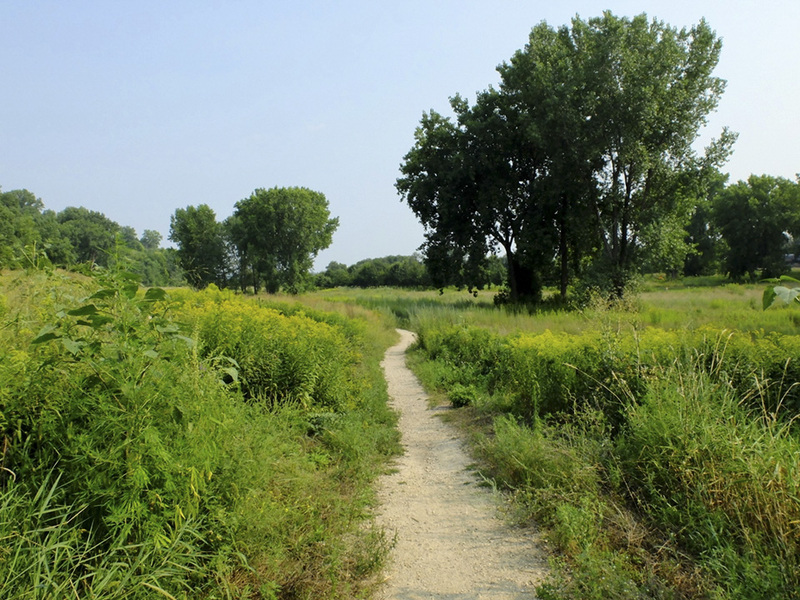 There is an ongoing effort to restore the land’s ecology and native plant communities, though reminders of the industrial history have been left in place. The sanctuary has also become a significant location for birdwatching and for educational opportunities. This entry was posted in Nature Destinations and tagged Bruce Vento Nature Sanctuary on August 24, 2018 by John Valo. Rusty crayfish (Orconectes rusticus) is a medium- to large-sized freshwater crustacean. It is native to Michigan, Ohio, and Kentucky. It is used extensively by fishermen as bait, and is sold as an aquarium pet. Unused bait and release of aquarium pets have resulted in the introduction of this species across the United States. It is considered invasive outside of its native range. Rusty crayfish are extremely aggressive. They out-compete and eventually eliminating native crayfish species when introduced into a new site. Juveniles have a higher metabolic rate, eat twice as much, and develop much faster than native crayfish species of similar size. Rusty crayfish is identified by a rust-colored spot on each side of its upper shell; a rust-colored stripe on the uppers side of its abdomen; and very large claws with an S-shaped movable finger. 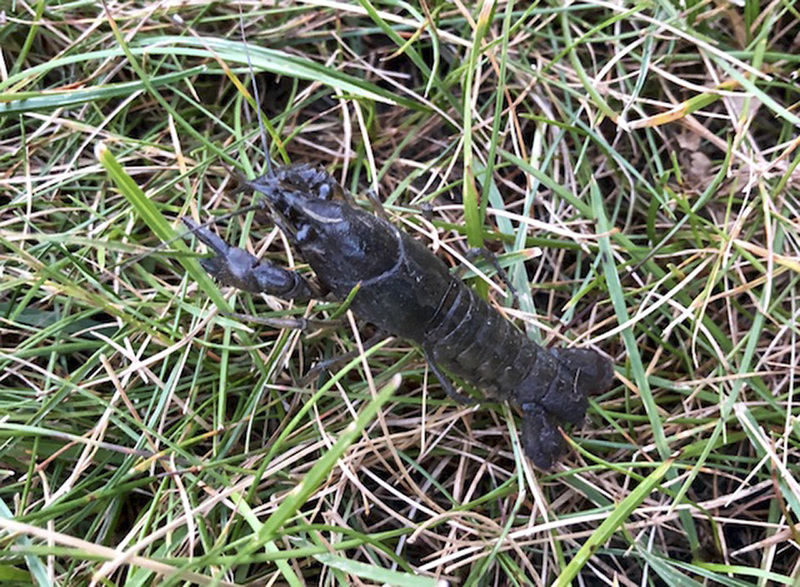 This entry was posted in Crustaceans and tagged Orconectes rusticus, rusty crayfish on August 15, 2018 by John Valo.